3. Each Important Function is Supported by Many Elements: Important basic needs such as water, food, and fire protection should be served in two or more ways. To build in redundancy into a design, one must always examine the functions of the site. Depending on contextual factors such as geographic locations, inherent natural resources, and the socio-economic factors at play, the design will dictate certain functions which will take precedence. For example fire protection might be paramount in parts of Australia while the Eastern Deciduous Forest of North America are areas where fire is very rare. Below is a list of common functions one will find on a site and some of the elements to support this. Inherently nature does this through its important functions such as nitrogen fixation as an approach to its desire to accelerate succession. In a recently planted small orchard/ food forest in Bulgaria, I witnessed a collection of nitrogen fixers stacked in space and time which is another one of the Permaculture principles as they all overlap so eloquently. 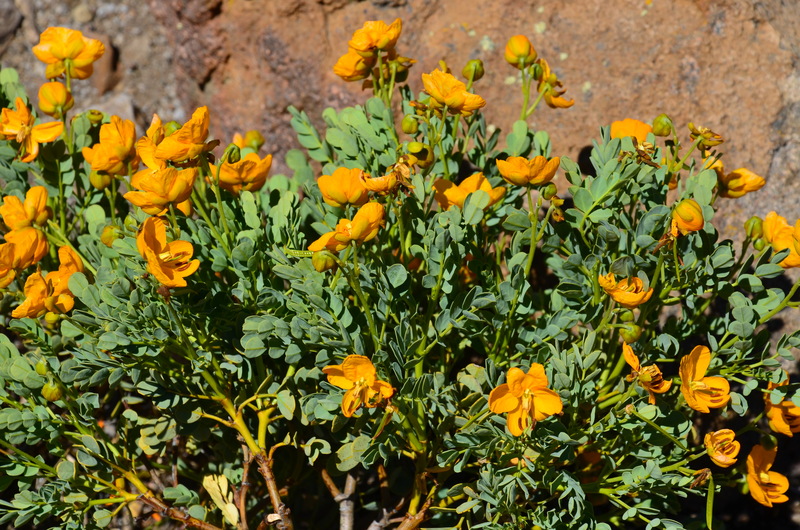 Anyway the field had low growing clover, a taller series of types of bush clovers and alfalfas, the vining species of vetches, as well as Black Locust trees on the outskirts of the field along the fencerow. Nature didn’t use just one species at one height and at one time, yet there was diversity in and amongst the many plants that were performing that function of nitrogen fixation and the greater plant family that was pushing succession along and repairing this plot that had once been a potato patch for many years. So as we see below, one of the prime directives in Permaculture is to design in systems that will re-enliven the full hydrological cycle. Thus this important function of slowing and sinking water is supported by many different elements. It is commonly said that each function should be supported by three different elements, using our creativity and information to understand the time and space relationship that would occur in your given context and at that particular time of year. For instance pond building is always a favorite elements that people like to incorporate into designs but that may not apply if your soil does not hold water all year round. Consequently if you build a dam without the due diligence of observing other local techniques of storing water and soil testing, then your pond simply turns into a large rain garden. This of course still helps with the important function of slowing and sinking water but if you wanted that pond to also be used for irrigation later in the season or aquaculture, then the lack of water retention is a failure. Thus we continue to use functional analysis and our direct observation to make sure that techniques used in one context aren’t automatically employed in others just because of a previous success. Instead don’t be a rubber stamp like traditional development and design how nature does, filling niches with what is appropriate while building in redundancy. 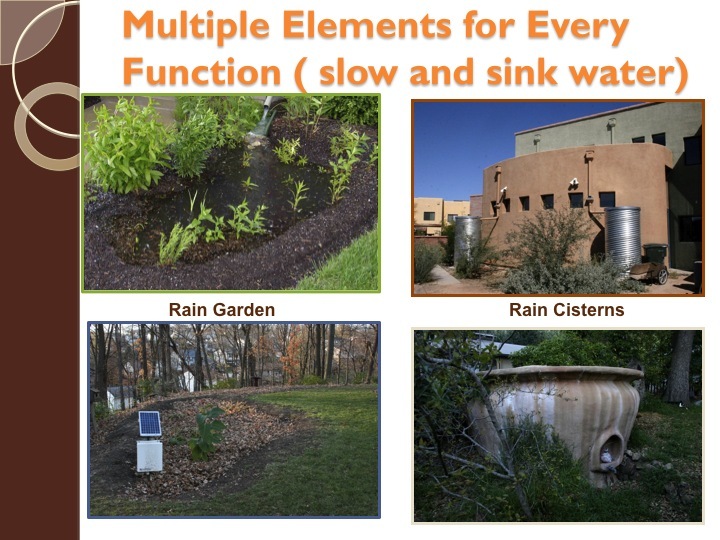 Rain gardens: simple berm and basin mostly on level ground directing runoff from impervious surfaces such as roofs and driveways with vegetation to help increase infiltration and filtration. Rain Cisterns: tanks of various materials and dimensions constructed and placed to harness valuable roof run-off ofr alter use such as irrigation or drinking. 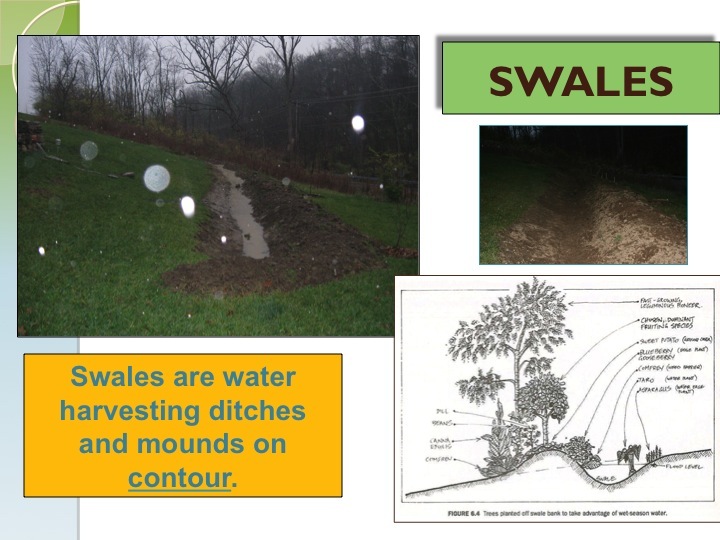 Swales: Another berm and basin technology on slightly steeper ground to catch overland flow from lawns but also as in the above case roof run-off that had been wastefully and pollutingly piped into a suburban landowners backyard by original developer. 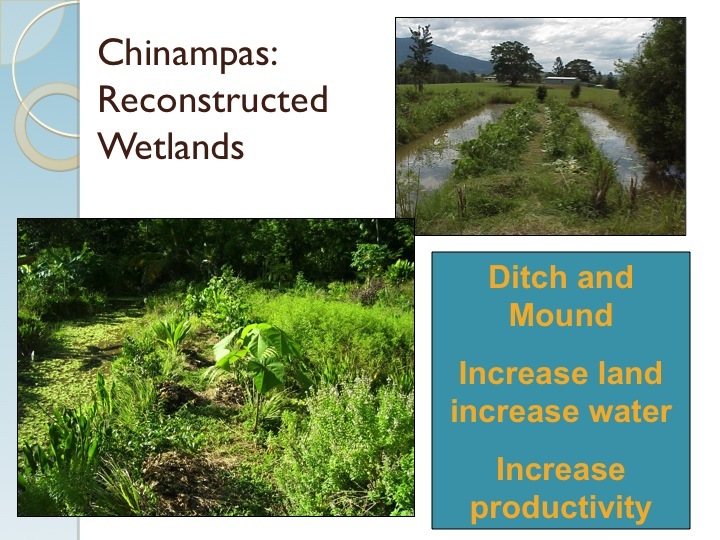 Chinampas or reconstructed wetlands: using high water tables and the productivity of aquatic plant growth to spur on soil development, food production, and slowly moving water through a sight with lots of edge. 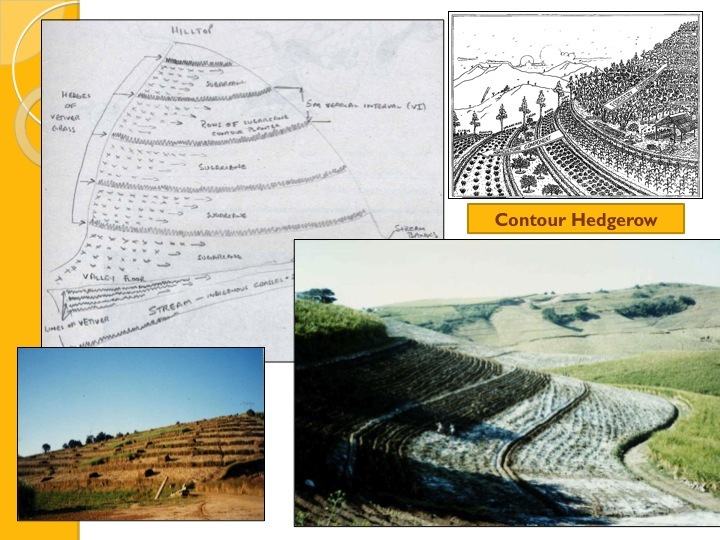 Contour Hedgerows: Using contour plantings such as vetiver grass to hold soil on steep hillsides with crops integrated between rows of contours. Dams: compacted earthen areas with the intention of water surface storage and other functions such as habitat or irrigation. 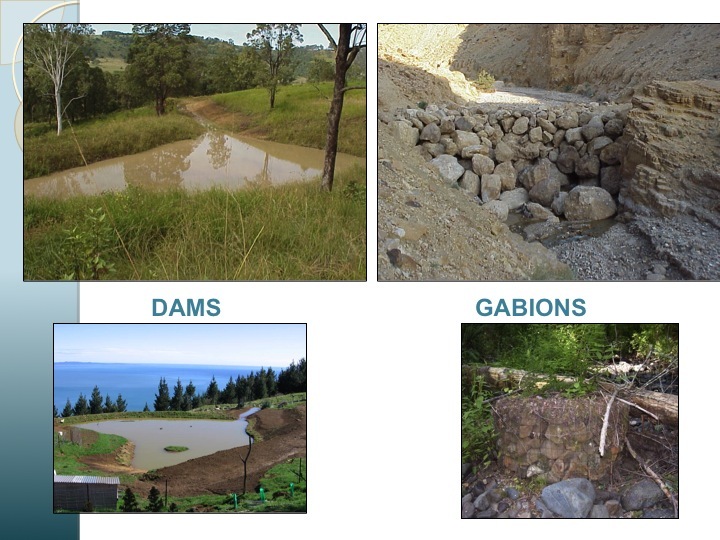 Gabions: rock construction in streamways to alter the flow of water and trap sediments behind the rocks or force its deposition on the banks by the newly created curves. 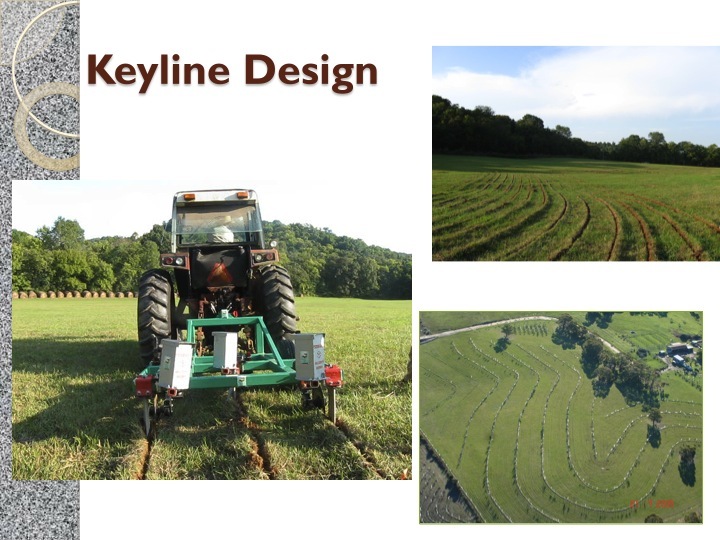 Keyline Design: great Broadacre application of using the a pattern in anture to maximize water runoff by forcing it to the ridges where it is allowed to infiltrate and hydrate landscapes extensively. 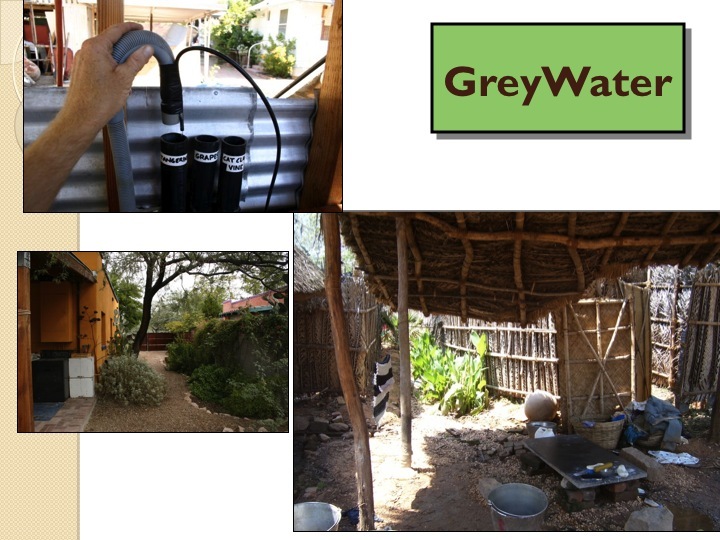 Greywater: re-using water in the landscape that comes from a household source of use such as a shower or laundry water. All the above techniques can be combined to cycle energy and create abundance on a site while mitigating erosion and drought. Again design how nature does, with redundancy- multiple elements for each function and how each element can perform many functions. Mollison, B. & Slay, R.M. (1991) Introdcution to permaculture. 2nd Edition. Sisters Creek, Tasmania, Australia. Tagari.